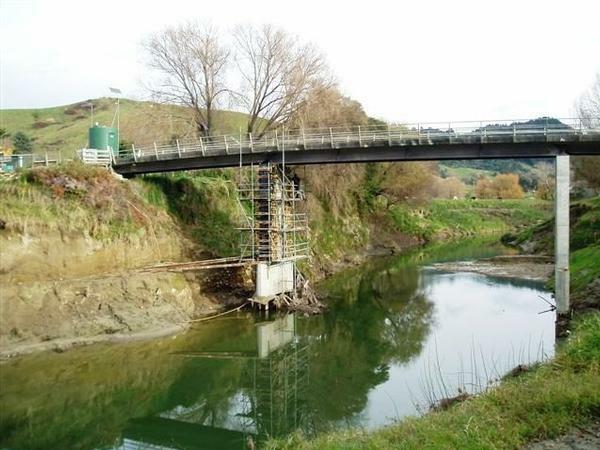 Trucks carrying logs, fertiliser or stock will now be able to use Goodwin Road Bridge after a $300,000 project to strengthen the piers and deck was completed. Goodwin Road is off Riverside Road and provides access to farms and forestry blocks. Previously the 50 year old bridge could only take up to 16 tonne vehicles which meant that trucks with heavy loads had to ford the river at low tide. Local company BH Ritchie and Sons won the contract and finished the work earlier this month. The bridge strengthening was signalled as part of Council’s Ten Year Plan roading programme. New Zealand Transport Agency contributed 59% of the costs. There are 30 bridges within the district’s that can not take more than 20 tonne vehicles. Over the next ten years Council plans to strengthen several of these to class one level. Existing bridges on major routes will be analysed to determine whether they support larger trucks which are capable of carrying 64 tonnes. This will go a long way to opening up the district’s roading network to meet the transport industries requirements,” says Mr Hadfield.